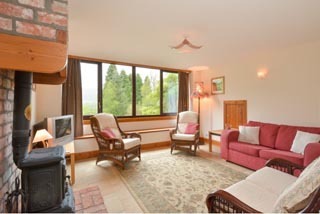 Holiday house accommodating 6-8 people, with secluded private garden. Freuchies Mill is a recently converted, stone-built former threshing mill, in a beautiful country setting. beauty of thePerthshire Hills and Angus Glens - on the edge of the Cairngorm National Park. Freuchies Mill is situated close to Kirkton of Glenisla, a picturesque and friendly hamlet within the beautiful and unspoilt countryside of the Isla Glen on the fringe of the Cairngorm National Park. The varied landscape in which rolling pastureland borders forest, heather moor and rugged mountains creates a backdrop of exceptional natural beauty, a paradise for the lover of wildlife and photographer alike. Its location, near to the Perthshire/Angus border, makes it the perfect base from which to explore and enjoy the abundant attractions of both counties. The region offers endless opportunities to enjoy a huge variety of outdoor pursuits which include walking, cycling, climbing, canoeing, white water rafting and many more. The area boasts over 40 golf courses and a nearby riding centre offers trekking and lessons for all ages and abilities. In the winter months, when conditions permit, the ski resort at Glenshee can provide unbeatable skiing or snowboarding experiences for the expert or novice alike. Tuition and equipment hire are also available locally. For the country sports enthusiast first class shooting and stalking are available on local estates whilst permits can be obtained to fish the many rivers, lochs and reservoirs in the area. The region's dramatic history has left numerous castles, historic houses and places of interest to visit whilst the Scottish tradition of whisky making has added a wealth of distilleries each offering a distinctive visitor experience. Moving further afield, enjoy a day trip to the dramatic coastline of east Angus with its beautiful sandy beaches and quaint fishing villages or take time to explore some of the other Angus Glens. Royal Deeside and Balmoral are just an hour's drive away through yet more stunning scenery. However, if you crave some retail therapy, visit the famous House of Bruar at Blair Atholl, the Fair City of Perth or the bustling city centre of Dundee. 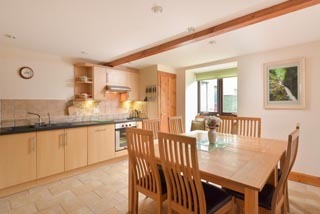 Freuchies Mill self catering cottage is a recently converted and extended former threshing mill built circa 1880. It is set within its own secluded private garden but has access to the grounds of West Freuchies, the main house. The front entrance door of the Mill leads straight into a stunning sun lounge extension which, like the original building, is built of local stone. Furnished with a cane three piece suite and coffee tables it is provided with a music centre and a selection of board games and books. The room has exposed timber beams and roof structure, picture windows with views over the garden and French doors opening onto a patio with sheltered barbecue area and garden furniture. A separate and generously proportioned sitting room contains more comfortable seating, comprising another three piece suite and a double sofa bed. Additional side tables with lamps and a combination TV and DVD/Video player are also provided. The huge full width picture window and window seat provides views over the glen, and the wood burning stove with its feature fireplace ensures that the room remains cosy even in the harshest of winter conditions. The roomy, farmhouse style, fully fitted kitchen is equipped with integral dishwasher, larder fridge/freezer, electric fan oven, ceramic hob, washer drier and microwave. There is also a large selection of quality crockery, cutlery, glassware, cookware and utensils. The massive ash wood table with eight upholstered dining chairs is as comfortable for dining as it is for playing games or socialising and is often in use late into the night. Also on the ground floor is a spacious shower room with a large shower cubicle, toilet, wash basin, shaver light and heated towel rail. Whilst there is ample room to manoeuvre a wheelchair it should be noted that there is a step up to the level of the shower tray. From the ground floor the feature staircase leads to the first floor landing where the guest is faced with exposed stonework of a part of the original walls. The two main bedrooms are both large and of similar size. Both feature luxurious superking sized beds. These are zip and link type and can be arranged as either double or twin to suit guests' requirements. 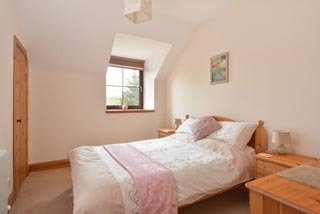 The third bedroom is slightly smaller and is a very pretty room, provided with a standard double bed. 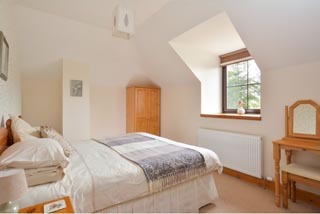 All of the bedrooms are light and airy and furnished with pinewood furniture comprising bedside drawer units with lamps, a dressing table with table lamp, mirror and stool and ample wardrobe space. 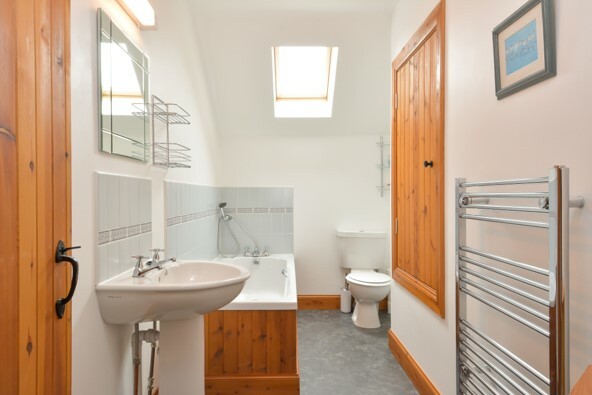 The first floor bathroom combines comfort and functionality in an attractive style. The suite includes a bath with shower attachment, WC, washbasin, shaver light and heated towel rail. From Perth in the south travel to Blairgowrie then take the A926 east to the small town of Alyth. Ignore the left turn into the town itself but continue on to the roundabout which follows and take the second exit signed B954 Glenisla. From the roundabout to Glenisla is about 10 miles and the route is well signed. Just before reaching the village look out for the River Isla alongside the road on your left and, shortly afterwards, the sign at the start of a Forestry Commission road on the right. Follow this road for half a mile ignoring turnings to right and left. The entrance to West Freuchies and Freuchies Mill is on the right hand side flanked by large stone pillars. From the north, coming from Royal Deeside, take the A93 from Braemar, signposted Blairgowrie. About 5 miles after the Spittal of Glenshee, watch out for the B951 junction on the left. Follow that road through Glenisla village (Glenisla Hotel is on your left). The road bends to the right and sharply to the left before exiting the village. Take the next turn sharply left where the West Freuchies sign is positioned and follow the Forestry Commission road for half a mile as above. Heating is included and the first barrow load of logs is free, subsequent loads are charged at cost. Bed linen and towels are provided. Dogs by prior arrangement only. Free WiFi broadband. Freuchies Mill is rented out throughout the year. Saturday changeover - check out by 10.30 am, check in after 3.30 pm. Short breaks out of season (min. 3 nights), last minute breaks etc on enquiry. Discounts for small parties, short breaks etc on enquiry. To book this beautifully converted mill near Blairgowrie, click the enquiry button below and see availability and prices. Freuchies Mill accommodation pictures by Square Foot Media. This delightful mill conversion offers superb accommodation for 6 in the glorious Perthshire countryside. With so much to do nearby this is an ideal base for exploring the area - it's also a great place just to relax and enjoy the comfortable house and garden and spot the local wildlife!